Yellow Ladybugs is an Autistic-led non-government organisation with strong bridges to the community. We are dedicated to the happiness, success and celebration of autistic girls and women. We believe all autistic females deserve to be recognised, valued, accepted and supported in order to realise their full potential. We are committed to shining a light on autistic girls and women through the creation of positive and inclusive experiences for our members, and through advocating for the rights of all autistic females and celebrating their neurodiversity. Yellow Ladybugs runs regular informal social events for autistic girls, generally between the ages of five and sixteen. Our events bring our members together in an inclusive, fun and sensory-friendly setting. Underpinning every Yellow Ladybugs event, our mission is to foster a sense of belonging for all our autistic girls, to help them connect with their tribe, and to instil a sense of autistic pride within our community. We are also committed to changing the common misperceptions about autism, ensuring autistic girls and women are properly supported according to their needs, and building a society that values and empowers all autistic females. We actively seek to address the many challenges the autistic female community face, including barriers to diagnosis, lack of inclusion in school and employment and access to support services. 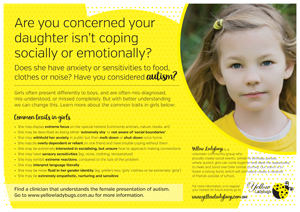 A comprehensive guide to greater visibility, better understanding and improving support for autistic girls by Yellow Ladybugs together with the Department of Education & Training Victoria, in collaboration with autistic females, parents, teachers, allied health professionals and academic researchers. We have recently started a birthday card club for girls. Click HERE for more information. Make a difference. Donate today. Yellow Ladybugs is a DGR charity. All donations of $2 and over are tax deductible. If you would like a receipt, please email accounts@yellowladybugs.com.au.